J&D Manufacturing has the control for you! 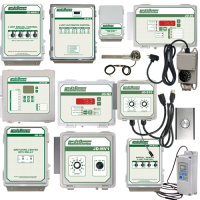 They offer a full range of controls that can operate everything from a single fan all the way up to controls that can monitor and regulate your entire environmental system. All of their controls are fully compatible with their extensive line of fans, inlets, lighting and cooling products. J&D is the leader in environmental control systems to meet the needs of your buildings. Using data such as air exchange, velocity, mixing, cooling, and humidity we can get optimal results for your facility. We offer full control of ventilation or lighting at the touch of a finger. Remotely monitor your system for piece of mind and for money saving efficiency.